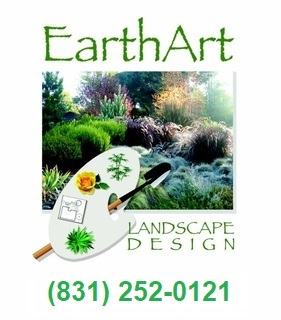 We at Earth Art are committed to making our clients dreams and visions for their landscape, yard, garden and outdoor environments become a living reality. Our goal is to provide you with a sanctuary, a place of peace and relaxation, with landscapes that uplift the spirit and create an experience that will recharge you emotionally and spiritually. 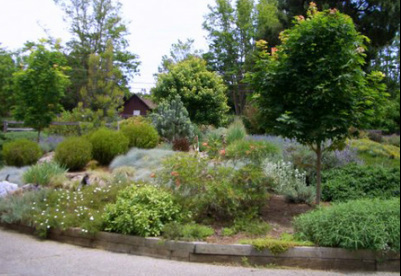 Since 1988 Earth Art Landscape Design has been offering a broad range of landscape services to residents, homes and businesses in the greater Santa Cruz, California area. Quality of service and customer satisfaction are always our primary goals, and we provide both at affordable prices. From landscape consultations for the avid do-it-yourself-er, to professional landscape designs and installations for those seeking nothing but the best. As experienced and knowledgeable horticulturalists, we can also offer a lot more than your average landscaper. 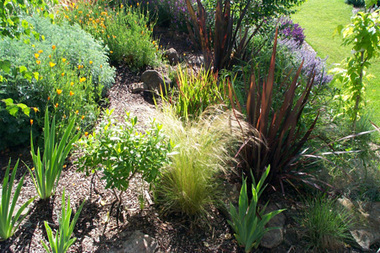 From deer resistant gardens to water-wise/drought tolerant gardens and landscapes, we will turn your earth . . . into art! As comprehensive landscape contractors Earth Art provides complete landscape consultation services structured to educate those who love their gardens and are inclined to the "do-it-yourself" way. 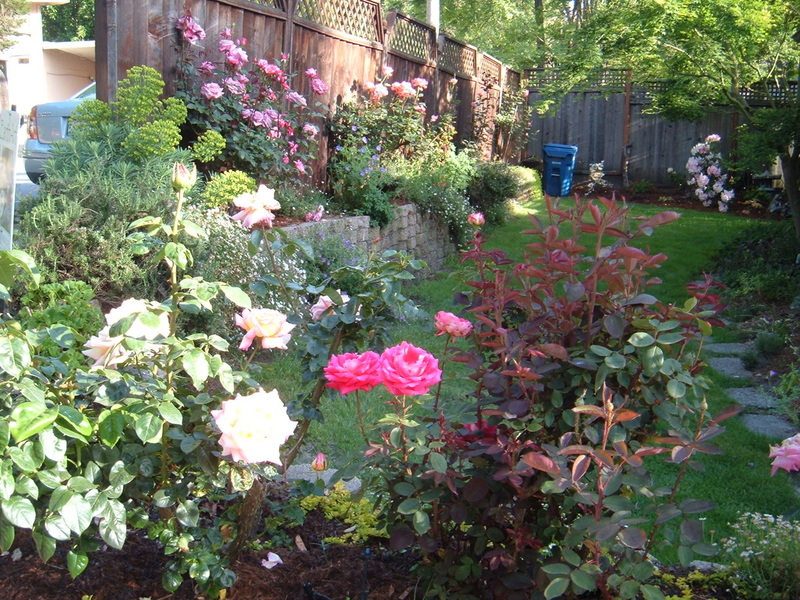 We offer instruction on how to design, create, and maintain your garden in all aspects. We walk our clients through the complete process of planning, site preparation, hardscape design elements, plant choice and placement, irrigation requirements, and of course, the thousands of plants, trees, shrubs, bushes and flowers available to make your garden the best it can be and ensure it will have a hearty, beautiful and sustainable life for many years to come. Call on us for a professional landscape consultation today! Ready to go pro? We will provide detailed planting and irrigation designs upon customer request, custom created to suit all of your needs, visions and preferences. More than just your average landscape company, we are horticulturalists - which means we bring a depth of understanding about which plants, trees, shrubs, flowers and other elements are available, when and where they will grow best, how they will interact with one another and nature, and most of all, how they will help make your landscaping dreams a breathtaking and sustainable reality for many, many years to come. Once our design is complete, our professionals will apply this same skill and depth of understanding to the complete preparation, planting and installation of your new landscape. 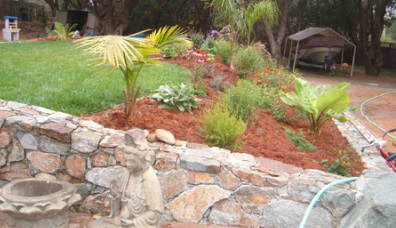 Turn your bit of Santa Cruz earth into art - Call on us for landscape design and installations services to make your yard and garden dreams a reality today! While plants, trees, shrubs, flowers, bushes and all living elements are known as a landscape's "softscape," decorative concrete patios, brick and stone walls and pathways and other aspects are known as the hardscape. As a complete landscaping specialist, Earth Art is also highly skilled in the integration of any and all concrete and stone work that is designed to blend in with your landscape, make it more beautiful and functional, and provide it with a look that is both original and natural. We design and install stone walls, patios, and garden paths that will maximize the usefulness and appearance of your garden and can also assist with other hardscape aspects such as fire pits, arbors and much more. Anyone who has ever planted a garden in an area frequented by deer will be familiar with the frustration, expense and at times demoralization the endeavor can bring. Relying on published "lists" of so-called deer-proof plants, or on the knowledge of a landscape architect that follows these same lists is, in reality, not a strategy for success. Only genuine knowledge, hard won over years of experience gardening and landscaping in deer-heavy areas, will do the trick and Earth art brings such knowledge and vast experience to the job. There are literally thousands of different plants, herbs, grasses, flowers, trees and more from an array of different families, in all different shapes, colors and sizes that deer will not eat and which will also prosper in the California. If you are looking to keep and grow your garden without also losing it to visiting deer, call Earth Art Landscape Design to put our decades of experience on the job. While we are fortunate to enjoy a mild, temperate climate and more days of sun than not, drought is an inevitability in California. With an increases in population and a finite amount of water to go around, there are always going to be years when we face water restrictions in the Santa Cruz area. But real concerns about water usage need not hamper your dreams of having an amazing and original looking landscape. Xeriscape is the art of using low-water, drought-tolerant plants, tress, shrubs and flowers along with stone, rocks and other no-water-use elements - in place of grass - to create a landscape that is lean on water and lush on beauty and creativity. 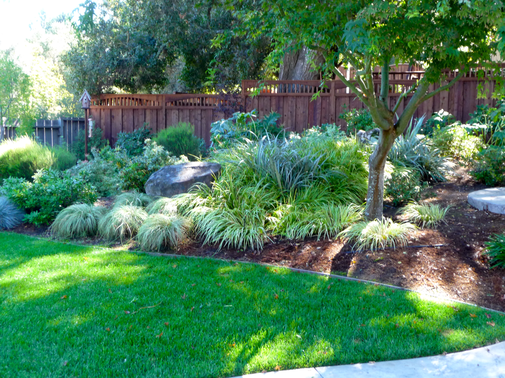 If you're looking to make the switch to drought-tolerant, water-wise landscape, call the Santa Cruz area experts! While natural sunlight reveals the beauty of your garden and landscape by day, it is the art of well placed landscape lighting that will reveal an entirely different world of beauty and enchantment by night. In addition to providing added security, landscape lighting is one of the hidden secrets in the art of an outstanding landscape. We are equipped to design, place and install all kinds of landscape lighting systems. If your dream outdoor environment has always included a waterfall or other type of water feature, we would love to make this part of your landscape design as well, enhancing the natural beauty and serenity your property engenders. We design and install state-of-the-art irrigation systems that are water efficient and will meet the needs of the landscape. We are constantly educating ourselves in the latest irrigation technologies and codes and bring this expertise to every job. If you have an older irrigation system that is in need of upgrading or repairs, call on us as well as your local Santa Cruz area experts! Roses need to be pruned annually. We pruned these roses after they had been neglected for a number of years and the results were far beyond the owners expectations. We feel that proper maintenance of a garden is just as important as the initial design and installation in your gardens appearance. Why spend thousands of dollars on the initial landscaping only to watch it deteriorate over the next few years? Earth Art offers a service that we call "Periodic Intensive Maintenance". We leave the lawn mowing and leaf blowing to your regular gardener but on a periodic basis we come in and do the intensive tasks that they have neither the time, inclination or knowledge to undertake. Pruning: Regular pruning is is absolutely vital to the continued health and vitality of a garden. If neglected, your plants will look woody and leggy. The number one factor leading to the deterioration of most landscapes is lack of pruning. Irrigation Upkeep: The cost of water is has led to the use of drip irrigation which is far more water efficient than sprinklers. The downside to this is that drip irrigation requires more maintenance. It needs to be checked regularly for clogged emitters, leaks, or broken components. The ends of the lines should be opened and the lines flushed of debris. Filters need to be cleaned. Location of emitters may need to be modified as your plants grow. 3. Mulching: The benefits to mulching your garden are numerous. A thick layer of mulch prevents the proliferation of weeds, prevents the evaporation of moisture thus saving water, and adds organic matter to your soil.4) Fertilizing Over a period of time, your plants will use up the nutrients in the soil and may need to be fertilized to stay healthy. Furthermore, the soil PH affects your plants' ability to uptake nutrients and may need to be adjusted. Our intensive maintenance approach involves a walk-through of your garden and a thorough evaluation of its needs. Aptos, CA and nearby areas. Last year, my next door neighbor and I decided to do a water saving rock garden project together. After walking around the neighborhood and getting ideas, we looked on Yelp for landscape design companies and I called several. Some never got back to me; of the 3 companies that actually came out and talked with us, Dave was the only one who thought he could do exactly what we wanted; he helped us design a mounded drought tolerant flower/rock garden. Birds visit, bees are constant, flowers bloom in beautiful colors, and it gets more beautiful everyday. Even though he did not draw out a design, Dave explained what he envisioned and it sounded like just what we wanted, and it has proven to be awesome. We have been very happy with the result. In addition, Dave has come out a few times since he planted everything, added plants, cut back the garden, and helped us for over a year. I would recommend Dave if you want someone who listens and cares about your project even after it is finished.